Just how smart are you ? 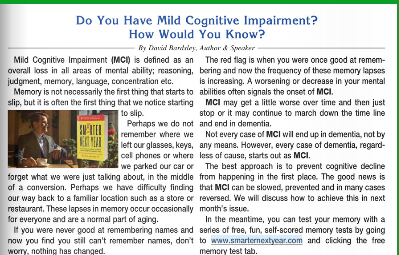 Do you have Mild Cognitive Impairment? How would you know? Dr. David Bardsley , retired Oral & Maxillo Facial Surgeon interview on his previous book The Less Than Perfect Child and living with ADHD and TOURETTES ( TS ) and how daily vigorous daily exercise saved him . He was able to become an Oral & Maxillo Facial surgeon and practiced in Vancouver, BC. 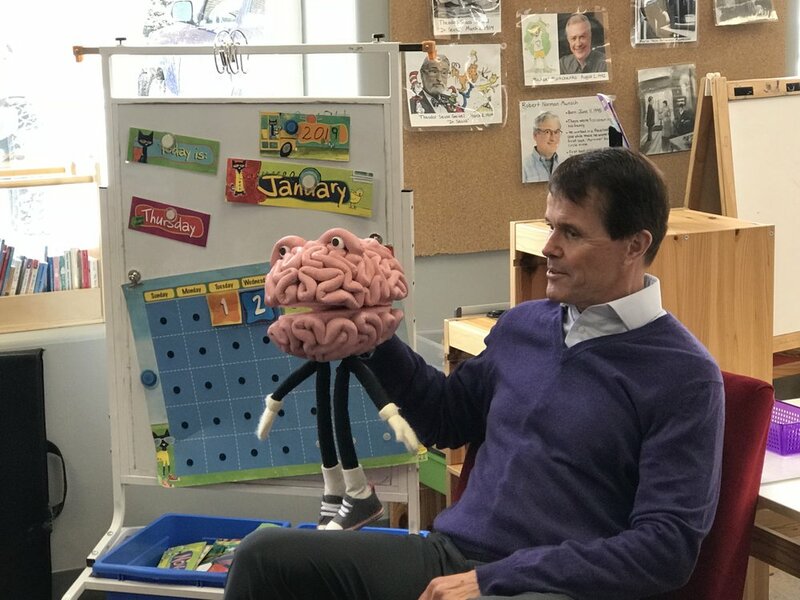 CBC interview : with David Bardsley discussing overcoming behavioural and learning disabilities with vigorous exercise and becoming an Oral & Maxillo Facial Surgeon. Whether in the workplace or the classroom, the ultimate competitive edge is an improved mind. Developing and enhancing cognitive ability is not a process limited to genetics or early childhood— it can be achieved at any stage of life. The concept that intelligence is entirely inherited and fixed is no longer valid. New scientific evidence demonstrates that the brain is highly plastic and cognitive ability can be increased at any stage of life—whether you are 25, 55 or 105. 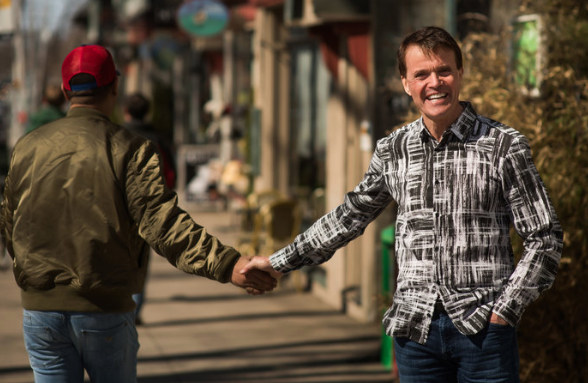 Dr. David Bardsley is living proof of the benefits of education and reveals tools we can use to shape our own destiny when it comes to the quality of our lives in his new book, Smarter Next Year: The Revolutionary Science for a Smarter, Happier You. Improve Your Sleep – Set a separate sleep alarm for 8 hours before your awake alarm. Studies have shown while we sleep, our brains are storing information gleaned throughout the day for future recall. In other words, if we didn’t sleep at all, we would have no permanent memories. Assess Your Medication – Work with your doctor to reduce or eliminate your medications, including over-the-counter drugs. One in four Americans take statins on a daily basis, according to the CDC, yet memory loss and confusion are among the drug’s top side effects. The more medications you take, the greater the potential cumulative cognitive effect. Boost Your B12 – One of the more common vitamin deficiencies is pernicious anemia, which is caused by lack of vitamin B12. All the B vitamins are crucial for the health and functioning of our brains. Have your vitamin B12 levels checked if you are taking proton pump inhibitors on a daily basis. Stay Active – The latest studies show that 30 minutes of vigorous physical activity a day is sufficient to promote growth of new brain cells. We are born with 100 billion neurons, but we lose about one per second, or 70,000-90,000 day. Exercise has shown we can grow new brain cells at any stage of life. Join Dr. Bardsley as he guides you through the program. You’ll learn the science, apply the knowledge, and be equipped and inspired to make lasting, positive changes in your life. In Smarter Next Year, Dr. David Bardsley shares his remarkable story of perseverance which led to his discovery of the strategies and tools everyone can implement to build their intelligence. His childhood was punctuated by years of intensive medical investigation, a period of institutionalization, and a misdiagnosis of having an intellectual disability by the time he was nine years old. diagnosis of Tourette Syndrome and ADHD was made, but he would go on to earn a B.Sc., M.Sc., D.D.S. and Fellowship in Oral & maxillofacial Surgery. After retiring from surgery, he began lecturing on the topic of preventing cognitive decline and sharing his program for boosting intelligence, which became wildly successful, spreading by word-of-mouth from CEO to CEO across North America. For more information, visit davidbardsley.com.